e provide our customers with an extensive selection of authentic Mexican furniture, rustic home furnishings and imported Mexican pottery that's easy to buy online. 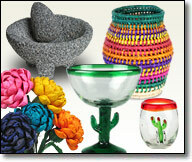 Since 1991, we have provided our customers with a wide variety of unique southwestern and traditional Mexican home furnishings and gifts. Our rustic furniture lines include pine, bent wood, mesquite, old wood, painted wood, twig and Equipale leather furniture. There are over 3,000 items on our web site and with the largest stocked warehouse in Arizona, most of our items are in stock and ready to ship. Our main product categories, listed below, are divided into sub-categories making it easy for you to shop our online store and find the perfect rustic furnishings and decor from Mexico. We hope you enjoy shopping on our site and please call us if you have any questions. 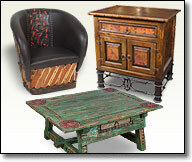 Our rustic furniture and home furnishings from Mexico are of the finest quality found anywhere. The sections are categorized Mexican pine, painted wood, mesquite and traditional. Our traditional Mexican furniture line features Equipale, bent wood and old door furniture. Tinsmithing in Mexico is an age-old craft. 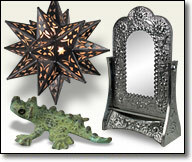 Elegantly carved candleholders, magical luminarias, as well as embossed tin picture frames and mirrors, engraved crosses, punched tin lamp shades and even our more contemporary pieces with traditional Mexican designs. Behold the rich colonial heritage of a Talavera pot, urn, vase or platter, the finest ceramics of Mexico. Our extensive collection of Talavera pottery and tile is a perfect place to shop for unique and beautiful home accents or gifts. 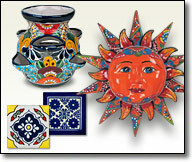 There are 14 different categories of unique Talavera ceramics for you to shop. Whether you select from our earthenware Mexican pottery or our aged-clay collection, these figurines, vessels and wall art find their inspiration and technique in Mexico's ancient art. Each style and finish is tied to an indigenous tradition and locale. 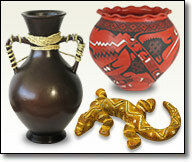 Choose from terra cotta, aged clay, Mata Ortiz and black clay. 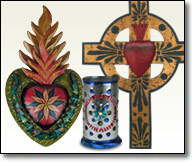 Mexican folk art, in its many forms, are represented in this category. You'll find beautiful handcrafted items you can give as gifts or to display in your home decor. This amazing array of Mexican folk art includes clay, tin, wood and glass creations along with Day of the Dead and religious themes by proud and talented artisans. Our marketplace collection invites you to create the color, texture and appealing atmosphere of Mexico's outdoor mercados in your own decor. Find piles of paper mache fruits and veggies, woven palm baskets, market bags, glorious paper poppies, hand blown glassware and Corona beer merchandise for your home bar.